Kidzrock is an exciting music program that teaches your child, even ones as young as 4, how to play an instrument in the setting of a rock band. Band members rotate on drums, electric guitar, and keyboard as they prepare to sing and play in an end-of-session concert. Students in Kidzrock learn how to play drums, electric guitar, and keyboards as they prepare to play in a real rock concert! The fun rock band format and performance helps kids fall in love with music and feel good about their abilities. WHO IS THE IDEAL KIDZROCK STUDENT? Your child might be too young for lessons. They aren’t too young for Kidzrock! Kidzrock is a nationally acclaimed music program that teaches ages 4-7 how to play an instrument in the setting of a rock band. A whole new age group can now experience the thrill of performing to a cheering crowd. Singing, songwriting, and concerts every 8-10 weeks make this a rather unique offering for kids in this age group. Even with all the different instruments your child will play, there are no instruments to lug back and forth to and from home and there are no practice requirements once you do get home. The name of the game here is teamwork. You can’t have a great band without it. Check out what parents have to say about Kidzrock HERE and HERE. Kidzrock has an enrollment fee of $30 and monthly tuition is only $109. You can read our full policy HERE. Fill out this form or call us during regular business hours and we will get your child started living his best life as a rock star today. The innovative program creates a unique experience by combining instruments, theory, singing, performing as a group and rock ‘n’ roll fantasy into a jamming good time that brings out the noteworthy superstar inside. Curiosity and imagination often motivate your budding artist to learn how to play an instrument. 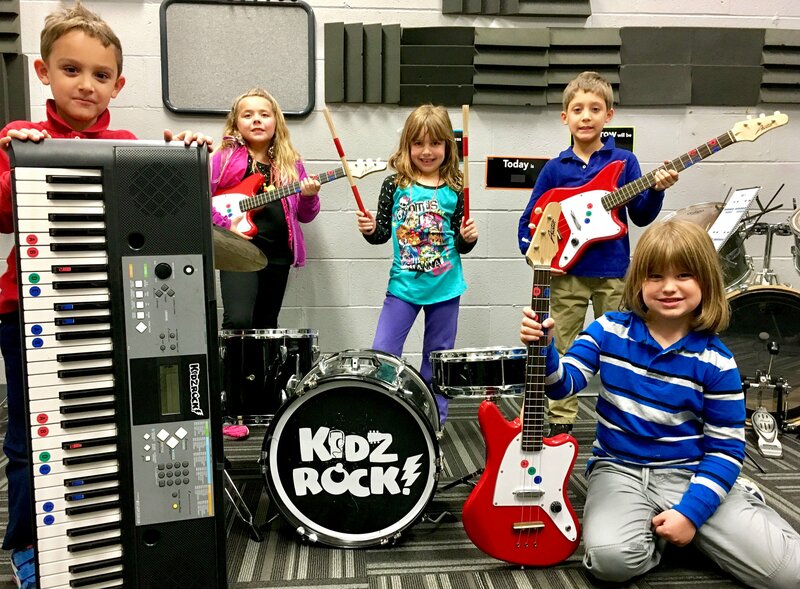 Within a few weeks, Kidzrock allows a child to experience the ultimate musical accomplishment- singing, playing, and performing in a rock band. Your sweet little rocker will learn how to read color-coded standard music notation while playing on modified instruments for her smaller sized hands.